There are many fun Christmas traditions for kids: it’s a big time for them, and they are always delighted with the magic of traditions and presents. Barcelona children have plenty of opportunities to enjoy the holidays, and in many cases you’ll be able to experience them, too. Celebrating Christmas in Spain is fun! The countdown for Christmas starts when you buy an Advent Calendar in a bookstore at the stationer’s (although some families prefer to make their own handicraft ones). This calendar goes from December 1st to Christmas, and has a little window for each day, that you open as days go by. Some of them hide a chocolate or little present behind each window – you bet children love them! Another of the top Christmas traditions in Spain for kids. Head to the Christmas markets in front of the Cathedral or the Sagrada Familia church to get your basic kit: Cave, Holy Family (baby Jesus, Mary and Joseph), the mule and the bull, the shooting star and the 3 Wise Men. Upgrade with as many shepherds, houses, bridges, wells and other figures as you like. 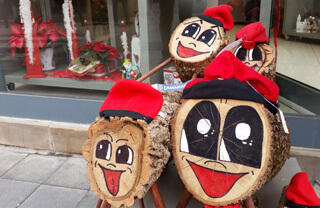 On Christmas Eve, a Tió or Pooping Log is set in a prominent place of the house living room. You cover it with a blanket, so it doesn’t get cold. But the trunk is still freezing, so children must warm it up so it can “poop” them presents, and that’s done hitting it with a stick and singing a traditional song that could be translated as: “Poop log, poop cottage cheese and honey, if you don’t poop enough, I will burn you”. Yes, maybe not too reassuring for the poor log but it is effective! After singing it a few times hitting the trunk with your stick, you can lift up the blanket and… surprise! the log will have pooped presents and sweets for you! You bet it’s one of the the most popular Christmas traditions for kids in Catalonia! A Catalan Legend says there is a Man that has as many noses as days are left before the year is over. This poor man can only walk in the streets on the last day of the year, when he has only one nose. The rest of the year he lives hidden. The last of our favorite family traditions for Christmas is to retell the story to our kids, then take them on a walk and tell them to watch out because maybe we might cross the mysterious Man of the Noses. 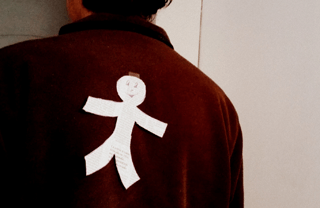 Then children walk around watching people noses and wondering who must be this mysterious man… A big-head carnival figure of the “Home dels Nassos” will be parading the streets of Barcelona: look for him! AND BONUS! What about Christmas carols? Family Christmas traditions in Spain include teaching kids Christmas carols and singing them along. 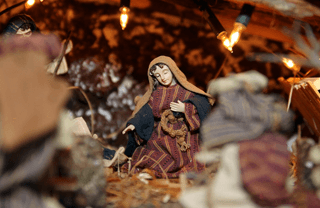 For instance, Holy Night has famous translations into both Spanish (Noche de Paz) and Catalan (Santa Nit). One of my favorite Christmas songs in Spanish is “Campana sobre Campana“, inspired in the rhythm of church bells. Another very popular one is “Pero mira como beben los peces en el río”, about fish drinking water in the river because Jesus is born (I know, it’s weird but…). And the third most famous Spanish carol is “Ande Ande Ande la Marinorena”, with catchy rhymes about the Nativity. In Catalan, Christmas traditions for kids also include carols: I love “El dimoni escuat“, about a scatterbrained devil that gets in trouble for interrupting some shepherds celebrating Jesus birth and ends up losing this tail. Another favorite is “A Betlem me’n vull anar“, about a shepherd trying to convince another one to go with him to Bethlehem, but the other keeps answering with excuses until he’s finally convinced. “La pastora Caterina” is a shepherd girl that brings oranges to Jesus as a gift, and “Fum Fum Fum” is another Christmas hit popular for its rhymes. But there are many more! I encourage you to check out Youtube to hear how they sound and discover some more! And go here to read more about Catalan Christmas Carols. What about you? Share your experiences with us by leaving a comment below and tell us: What are your favorite family traditions for Christmas?